Update (04/17/2916): Blue Buddha Boutique is closing its door permanently. The links to their website (below) are no longer active. Get a chance to win a Shaggy Loops Bracelet kit in any colorway (you can choose any 2 color) you prefer by leaving me a comment on this blog post between November 18 – 21, 2012 !!! This giveaway is open to everyone, not just US residents. I made the bracelet in several different colors. What color combination will you choose if you make your own version of the bracelet? The winner will be selected at random & will receive an instruction & enough jump rings to create a 7.5″ version of this bracelet from Blue Buddha Boutique. We can’t create chainmaille jewelry using randomly selected jump rings. In the beginning, whenever I learned a new chainmaille weave, I used to need some time to figure out the ring sizes I need. But, now, people who want to learn to create chainmaille jewelry do not need to go through a similar difficulty because – recently – Blue Buddha Boutique launched a number of chainmaille starter packs that simplify the process. 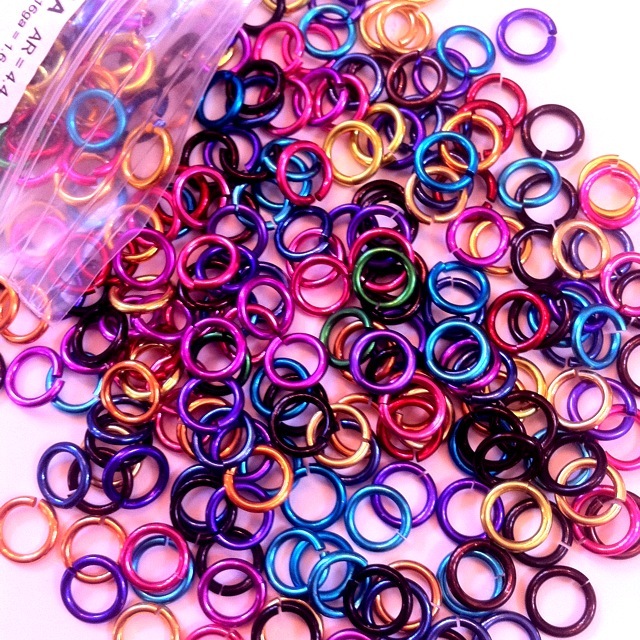 Every pack is different so you can start learning to make chainmaille jewelry by creating your favorite piece(s) & without having to purchase too many jump rings you might not need. The pack contains Euro Tool Ergo pliers coated with Tool Magic*, mini bead mat for holding your rings while you work, instructions (for right-handed & left-handed learners) and enough jump rings to create a Celtic Visions bracelet in the colorway(s) you prefer. They can make great holiday gifts, don’t you think? I’ve always seen chainmaille with silver, pewter, bronze, and gold, but adding color definitely makes a huge difference. I would love to win a pack!!!! 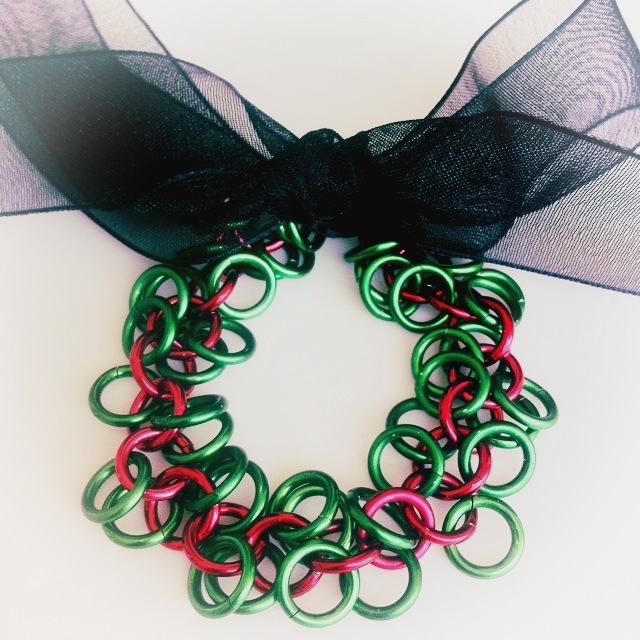 I love chainmaille and have found B3 to make it fun exciting and full of fabulous products. Can’t ask for more. Love them. Shaggy loops is one of the most resistible starter weaves. It is such fun to make and wear. Good luck to all of you. I once tried chain maille and got the same problem you describe : my rings were way too loose. I would love to try again with such a pack ! Lovely. Thanks for sharing these great kits. I know what several people on my Christmas list are getting now. Have never made any chain maille, would be thrilled to give it a go. 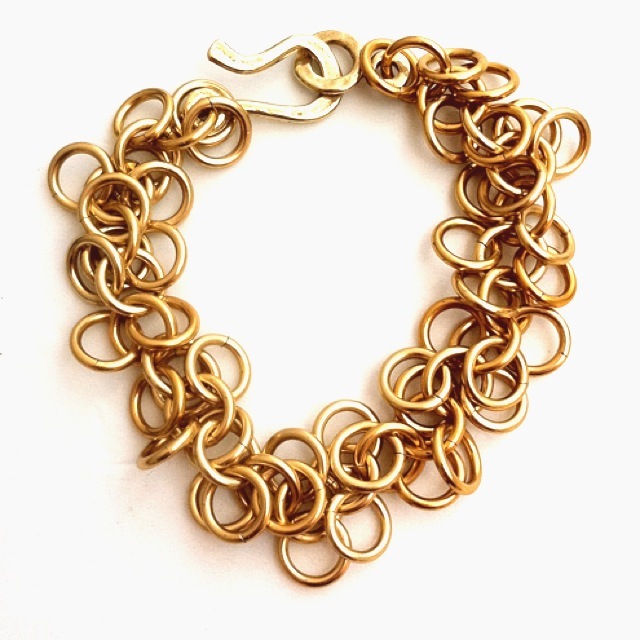 Chainmaille is very rewarding – it looks great very quickly! I think these are great kits, and I’d probably go with a blue/purple color palette. I love the colors used! I would love to try one of these kits! Started learning Chainmaille over a year ago and I love it! I’ve ordered other item from B3 in the past and was really happy with the quality. Would love to try this design! These kits look great, considering I don’t always have much luck in trying to work out how to do it myself. I would love to win! Your bracelets are beautiful! Thanks for the chance. Besides having the chance to win the amazing Shaggy Loops bracelet kit I also may choose the colours. What more can I ask?